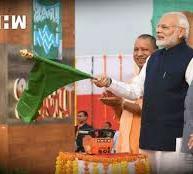 Varanasi-The Prime Minister, Shri Narendra Modi dedicated the Multimodal Terminal on the River Ganga, to the nation, and received the first container cargo. He inaugurated the Varanasi Ring Road Phase 1, and the development and construction for four laning of Babatpur-Varanasi Section of NH-56. He also inaugurated and laid the Foundation Stone for various other development projects in Varanasi.